I am not a big fan of red lip color. Now when I was younger I remember that’s the only color I ever wore. Different shades of red. However now I prefer to play up my eyes and wear more muted colors on the lips. On the tube it is a very bright fuchsia red. Scary, right? Well, not really. 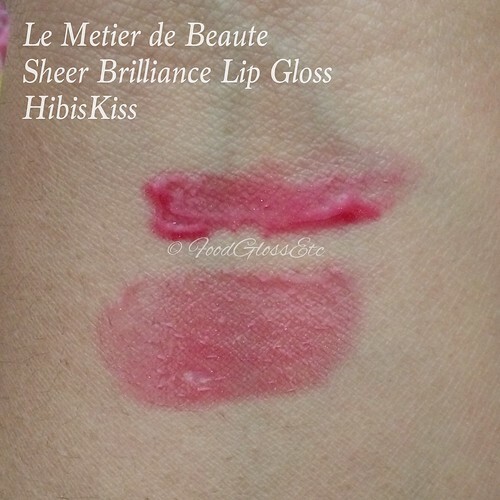 It is sheer after all so it just makes my lips very rosy. Which I dig on days where I have nothing on the eyes. Perfect for those minimal days. What I love about LMdB lip glosses whether they may be the sheer brilliance kind or the lip cremes, is that they are moisturizing (not a whole lot but does the job to maintain moisture) and not tacky at all. They don’t slip either. I don’t really take into consideration the longevity of lip glosses because I find it to be subjective (depends on how much you purse your lips together, if you ever lick your lips, drinking from a cup versus a straw, eating esp oily foods, etc). This one gives my lips consistent moisture, color and shine for at least 2 hours without doing anything (i.e., drinking and eating). I highly recommend Hibiskiss if you’re looking to start wearing red, a lover of red or just addicted to makeup. Here’s what LMdB’s website has to say about the product. 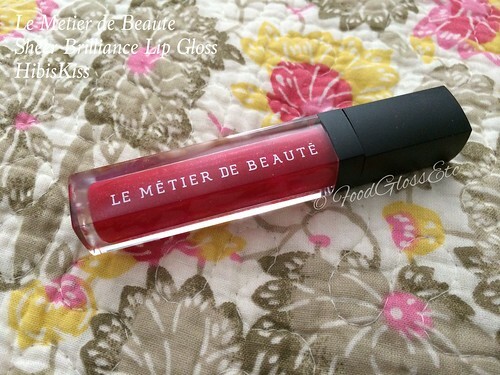 Le Métier de Beauté’s Sheer Brilliance Lip Gloss is luxuriously crafted to drench lips in a buildable veil of semi-transparent color that responds to the lip’s natural hue, giving everyone a custom shade all their own. The unique ultra-lightweight, hydrating formula is enriched with emollients and antioxidants for beautiful, supple lips. Wear it alone for sheer brilliant shine or layered over your favorite lip color for added depth and complexity. Silky, easy glide application for non-tacky, long-wearing color. Available at LMdB counters and online at Le Metier de Beaute, $32.